389 pages | 61 B/W Illus. Understanding the conditions under which variability in performance may arise, and the processes related to its emergence, gives us insight into the development of techniques for improving the quality of performance. 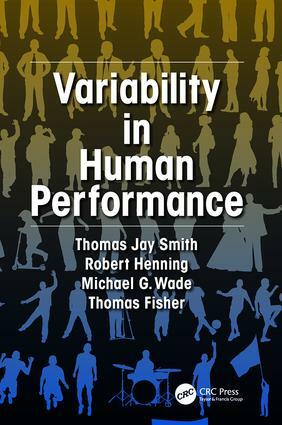 Variability in Human Performance details the scientific and the practical implications of human performance variability by providing a broad perspective on how and why such variability occurs across a number of disciplinary domains. The text takes an approach that rests upon the idea of context, or design, specificity in performance, namely that variability in performance is closely referenced to design factors in the environment in which performance is occurring. The authors also explore work performance as influenced by complex sociotechnical systems and as a basis for performance variability, applying control systems concepts to an interpretation of the nature and basis of performance variability in all of these domains. They conclude by taking an evolutionary perspective on the origins and behavioral significance of human performance variability. The book then provides strategies on how individuals, groups, and organizations can significantly reduce variability in human performance that often leads to systems failures. "Throughout, the book focuses on the sources of variability in human performance, including the design of work systems. The book will therefore be of interest to a wide range of HFE specialists." "This is a truly excellent book that increases awareness of the study of variability in movement performance. … Importantly, this book provides exciting discussions on theoretical problems on movement variability such as what are the sources of this variability." Fitts’ Law: Context Specificity in Movement Time Performance. Hick-Hyman Law: Context Specificity in Choice Reaction Time Performance. The Law of Practice: Context Specificity in Learning. The Influence of HF/E Design Factors on Student Performance and Learning. Impact of Classroom and School Building Design Factors on Student Performance and Learning. Impact of Learning Strategy Design Factors on Student Performance and Learning. Impact of Student Character and Emotional Status on Student Performance and Learning. Social Cybernetic Studies of Social Interaction and Teamwork Through . Design Factors and Variability in Social Tracking. Social Cybernetics in Participatory Ergonomics Programs. Assessment of Homeokinesis at the Team Level. Work Performance Variability and Interaction with Complex Sociotechnical Systems. A Control Systems Perspective on Organizational Design and Management: Role of Ergonomics. Variability in Fracture- Critical Systems. The Perversity of Unintended Consequences. Human Performance Variability: An Evolutionary Perspective. Thomas J. Smith has research and teaching experience and funding support encompassing many areas of human factors/ergonomics, including human performance variability, educational ergonomics, human error and hazard management, occupational ergonomics, occupational health and safety, surface transportation, occupancy quality, patient safety, work physiology, kinesiology, and ergonomics certification systems. He is a research associate with the School of Kinesiology, University of Minnesota. He is a Certified Human Factors Professional with over 100 publications. His honors include serving as senior editor for a recent special issue of Ergonomics in Design dealing with the topic of globalization of ergonomics, serving as chair of the Professional Standards and Education Standing Committee for the International Ergonomics Association (IEA), originator and committee member for the IEA K.U. Smith Student Award, editorial board member for the journal Theoretical Issues in Ergonomics Science, director and past president of the Human Factors and Ergonomics Society (HFES) Upper Midwest Chapter, general chair for the 2001 HFES Annual Meeting, member of the 2002 State of Minnesota Ergonomics Task Force, and member of the Dakota County (Minnesota) University of Minnesota Extension Committee. Robert A. Henning is an associate professor of industrial/organizational psychology at the University of Connecticut. He holds degrees from the University of Wisconsin-Madison in psychology (BS), biomedical engineering (MS), and industrial engineering (PhD). He also received three years of postdoctoral training at the National Institute for Occupational Safety and Health (NIOSH) in a fellowship program administered by the National Research Council. He is a board-certified professional ergonomist. Since 2006, he has been an active researcher in the Center for the Promotion of Health in the New England Workplace where he conducts research on programs that integrate workplace health protection and promotion through the participatory design of workplace interventions by front-line employees. Other research areas include social psychophysiology of teamwork, work and rest patterns in computer-mediated work, augmented team cognition, and behavioral toxicology. Dr. Henning has served as a NORA panel reviewer for work-related musculoskeletal disorders, as a human factors reviewer on the Soldier Systems Panel of the National Research Council/NAS, as panel reviewer for the Information Technology Research Program, Collaborative Systems, Division of Information and Intelligent Systems, Directorate of Computer and Information Science and Engineering of the National Science Foundation, and on the NIOSH Peer Review Panel for the National Center for Construction Safety and Health Research and Translation. He also served as the secretary/treasurer and president of Psychophysiology in Ergonomics (PIE), a technical group of the International Ergonomics Association, and as a founding member on the Executive Committee of the Society for Occupational Health Psychology. He has codirected a NIOSH-supported graduate training program in occupational health psychology since 2005. Michael Wade is professor of kinesiology and a faculty member in the University of Minnesota Center for Cognitive Science He is an internationally recognized scholar who has published extensively in two areas of movement science: developmental change across the lifespan, with an emphasis on individuals with motor difficulties, and a second focus on the effects of aging on motor skill performance. Dr. Wade holds Fellow status in the National Academy of Kinesiology, the American Academy of Mental Retardation, and the Research Consortium of the American Association of Health, Physical Education, Recreation and Dance. He is a past president of the North American Society for the Psychology of Sport and Physical Activity, and holds the Distinguished Scholar Award from NASPSPA. Thomas Fisher is a professor in the School of Architecture and dean of the College of Design at the University of Minnesota, having previously served as the editorial director of Progressive Architecture magazine. With degrees in architecture from Cornell and intellectual history from Case Western Reserve, Dr. Fisher was recognized in 2005 as the fifth most published architecture writer in the United States, with 7 books, 47 book chapters or introductions, and over 325 articles.